Although the photo doesn’t show, this castle is located in the very center of Senigallia, Italy, where I spent some time recently. 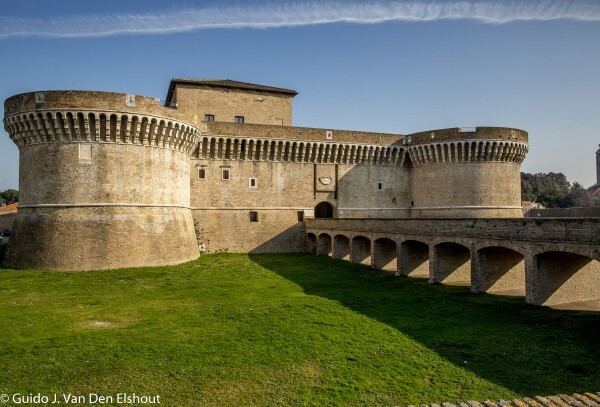 The Rocca Rovere is the most important monument of Senigallia, and like all medieval fortresses, can seem, from the outside, a simple and regular structure. Its complexity is shaped on the inside, where the dislocation of space is labyrinthine and, at first glance, even poorly designed. Its current structure is due to the will of Giovanni Della Rovere, Lord of the city from 1474 to 1501. He was the son of Federico da Montefeltro, Duke of Urbino that he made available the best architects of the time. The work was initially entrusted to Luciano Laurana, who designed the residential part of the fortress and the drawbridge that connected Directly opposite the square. The work was then entrusted to Baccio Pontelli that surrounded the residential part with real defensive structure, to form the quadrilateral at whose angles are placed four massive round towers, connected to each other and the central body, as an organic system of communication, vertical and horizontal. The apparent irregularity of the internal spaces and pathways is therefore a reality desired and sought by the same Pontelli, with the aim to create a sense of disorientation. The monument is therefore divided into two bobbins one incorporated inside the other: the main building, intended to stately home surrounded by the building intended for military defense. This is what distinguishes the senigalliese fortress, unique in its kind. The great architectural complex is the result of successive renovations over the centuries since the first defensive tower of the Roman era. The courtyard provides a reading of the four main stages experienced by Rocca: the first of the third century BC; the second of the fourteenth century; the third in the mid-fifteenth century, the fourth of the eighties of the fifteenth century. These include the Renaissance restructuring predominates over the others. The courtyard is functionally connecting element between the external input, which leads through the drawbridge, the residential part and the military. This courtyard appears typically fifteenth since it was renovated in Rovere era to fulfill the dual use of the barracks yard and backyard of the residence with a typical decentralized cockpit of the Renaissance, yet it retains remarkable remains of the former buildings. Originally it was also a passage that connected the courtyard with the underlying layer, ensuring greater communication and ventilation. Opposite the main entrance we can see a wall of the tower on which you read all the architectural history of the fortress: the Roman basis, the continuation of the fourteenth century Rocchetta, due to the work of the Cardinal Albornoz in 1350, the first XV century fortress, made build a century later by Sigismondo Pandolfo Malatesta, the signs of age Rovere, consisting in cutting at the top of the male present in previous constructions, following the new requirements due to the introduction of artillery. This part of the fortress, the result of many changes have occurred over time, clearly indicates that the area on which it stands has always been considered a strategic point in the city for the construction of a fort that constitute the core of the defense works. The wall with arches that you see on the right side of the courtyard is part of the fourteenth-century curtain, even if they were strengthened when it became necessary to the expansion of the section of the defensive wall to create shift plans for the artillery, masonry, which They replaced the wooden walkways. The tank of water collection, placed next to the fifteenth cockpit dates from the fourteenth century. It is circular, with a vertical slope slightly pine cone. Its particular location beauty and functionality allows us to state that over the centuries the current court was always intended to free space, more or less wide, surrounded by defensive walls. A similar thing can be said for the entrance: it in all buildings maintained the same position, as evidenced by the performance of the defensive walls of the previous packages. At the top of the main building are developed four towers. The “town chronicles” fifteenth narrate that the first tower to be built is in the sea, north to Fano, the second, the one sea to the east towards Ancona, the third and west towards the front of the square and the last south constructed by the military architect Baccio Pontelli. The succession of the buildings reveals that the most threatening dangers to Senigallia at the end of the fifteenth century were considered those that could come from the sea, was particularly so in periods of construction of the fortress Rovere, when raids by Turks threatened the entire Adriatic coast. This is evidenced by the presence in the north-east side of the fortress, the sea, the few openings and a single only be opened from inside, built later. The towers, despite appearances are all of different sizes and, going around the terrace, you can see how they were built to defend the main building of the fortress, once again highlighting the originality of this monument shows, in fact, as the fortresses are two, one completely incorporated in the other. Through the glass of the structure placed in defense of the restoration, you can see the battlements of the first XV century fortress and the architectural structures that allowed the mobility of the drawbridge. Looking out from one of the towers in the sea you can imagine better what was the defensive potential of the fortress. Its massive structure was surrounded by a moat filled with water, the placing of which was regulated by a system of doors and contained by a wall, roughly circular, as shown by antique designs. All around the terrace are visible loopholes that read IO DUX -I PRE and, outside, the grand culmination of corbels in white Istrian stone which is a pleasant contrast with the burnt brick used for the entire building. As for the internal structure, the residential area is spread over three levels, served by a double staircase, with access from the courtyard. The lower level was dedicated to the garrison and the housing for the officers of the militia, responsible for the defense of the fortress. Down the hall of this apartment terminal it is still possible a re-reading of the phases of construction and renovation of the fortress: the fourteenth-century, the Malatesta of which you can glimpse the spur under the grate, and Della Rovere. The superior rooms (three shows) were reserved to the representation of the Duke residence. The mail room to the terrace floor is part of the area designated by Giovanni Della oak residence of his court in times of emergency. In fact, simultaneously to these apartments, he began building a veritable palace, now destroyed of which only a beautiful coat of arms, presented in a simplified manner on the second floor of this building. The coat of arms of John Della Rovere which consists of a sphinx without wings topped by seven snakes and placed over a crest, was also depicted in a bas-relief placed on the south tower. This room was one of three reception rooms, those in which they could take place the festivals of the court and of which today is only visible this. The establishment was intended to chapel, presumably in the papal era, when the fortress was used as a prison. Through the main staircase of the area destined to the residence, you enter the real ducal apartment. The environment is very simple, given the very limited space as this was considered a residence for times of emergency. You may notice in this room the finely crafted capitals, and on the right of the entrance, the two that do not depict the winged sphinx, emblem of Giovanni Della Rovere. Here also they appear written IO DUX -I PRE that refer to major titles that Della Rovere had: that of the Duke of Sora and that of Prefect of Rome. 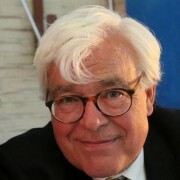 Even his marriage to Joan Da Montefeltro involved the acquisition, the Della Rovere coat of arms, the so-called “fourth kinship”, ie the blue and gold stripes with Aquiletta the Montefeltro family. These arms are inserted in the center of the vaulted ceiling of this apartment and, depending on whether you appear or not the arms of montefeltro you can go back to their dating. In fact, before 1478, the date of marriage, we find nell’arme roveresca two oaks, one of which would be replaced by urbinati bands. The reason of oak leaves and acorns is present on the doors and window frames. Of particular interest is the chapel of this apartment: it is a quadrilateral surmounted by a dome. Remarkable is the solution of the roundness of the corners of the walls through stucco that gives the chapel a harmonious aspect. The barn was a local service of the residential area, mainly characterized by the presence of a large tank probably intended to contain the grain needed for supplies to those who resided in the castle particularly in case of siege. They are located in the basement, in a quadrangular local cells for prisoners. These cramped prisons were obtained from places probably originally structured to be gunner. They are real death cells, as can be seen from the small vents that allowed more than survival, a slow agony. You can not say when it took place the transformation gunboat in cells, probably when the fortress was used as a prison. The path to access the upper floor is visible the ancient Roman defensive tower built of limestone spongy processed into large rectangular ashlar blocks, some of which corroded but overall very well preserved, since the tower was included in the successive restructurings that ‘ They are protected from the corrosive action of atmospheric agents. To connect these environments was built a beautiful spiral staircase but never used. This is confirmed by the lack of protection works that were supposed to mitigate the danger of steep steps monolithic. No, in fact, you never found traces of a railing. All made of white Istrian stone, it is certainly the most precious piece of the structure both from a stylistic point of view and from the engineering.